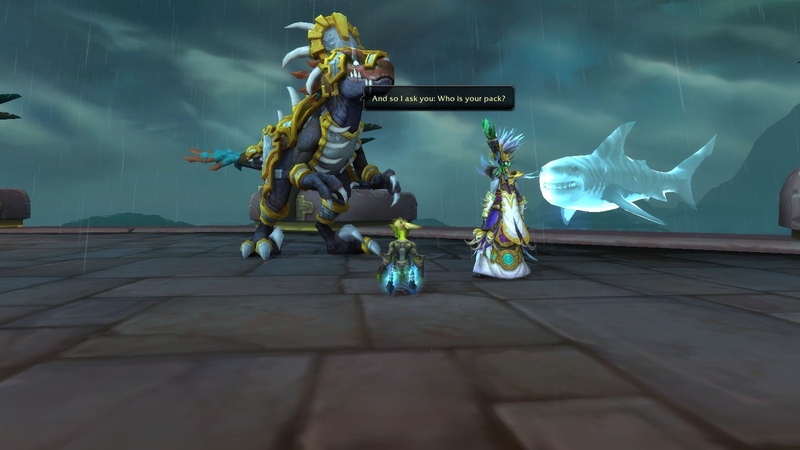 Allied race aside, it’s an important piece of lore in itself. 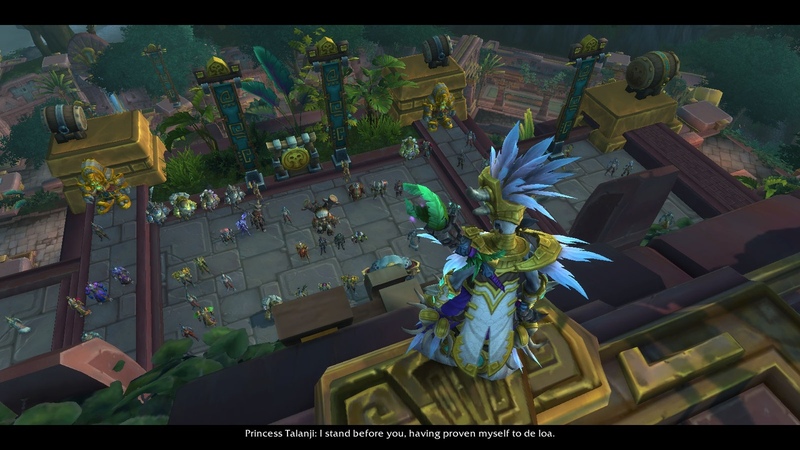 The core plot is Talanji’s crowning, and we follow her steps. 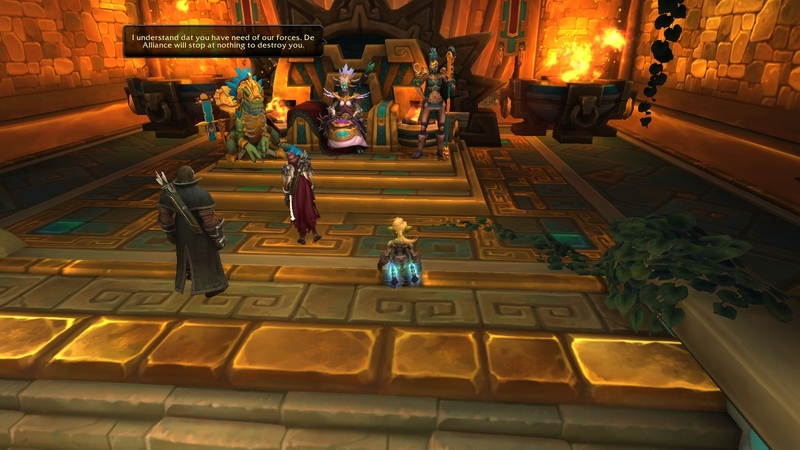 The first thing to do is to get to Zocalo – once again it’s the rebellious district of Dazar’Alor. 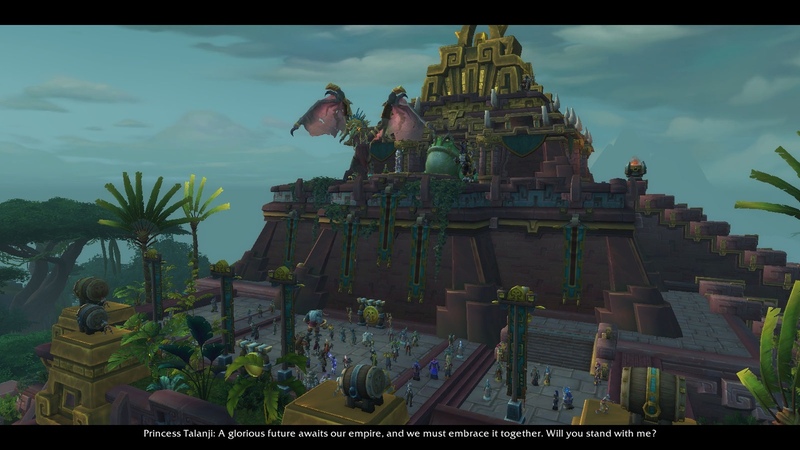 Loa priesthood and citizens there are not happy with the upcoming crowning, devastated with the Alliance’s attack, royal pact with Bwonsamdi and what not. We are sent twice to lower areas of the minor Zocalo pyramid to kill those most rebellious, beat the sense into hesitating zandalari and save the innocents. Our next step is ascending to the hall of priests and greet them – only to be attacked by a Shadra priestess who was behind the whole turmoil. Once she’s defeated, it becomes a peaceful trip to the top of the pyramid. The next stage brings us to Gonk – he only talks to Talanji and reminds her that her family, or ‘pack’ are not only the trolls, but also tortollans, vulpera and the Horde. The next one is Pa’ku: she unleashes a classic Run-against-the-wind-and-avoid-vortexes arcade game. 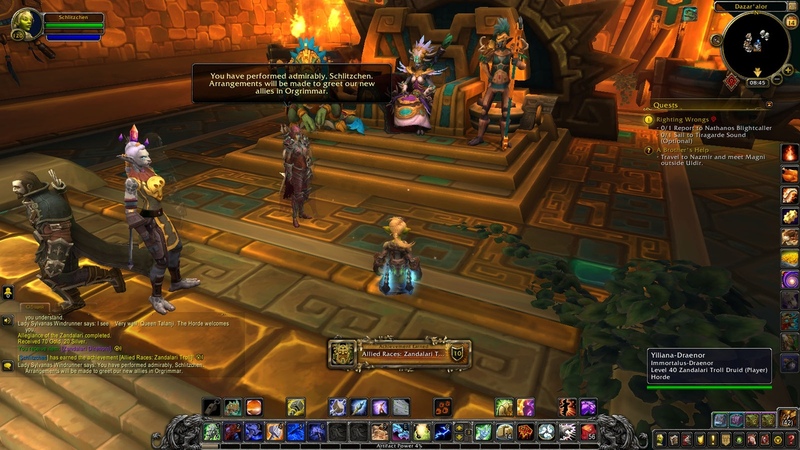 We can struggle with it, but it’s not required to get to the top: the quest ends when Talanji herself gets there. Sylvanas, Blightcaller and the champion are then summoned to the High Throne to bond the pact between Zandalar and the Horde. Talanji is firm that them and the Horde must walk side by side as equals, and no one commands the queen what to do. Sylvanas cannot contain her disapproval, but what choice does she have? She thanks the champion nevertheless for the job perfectly done. 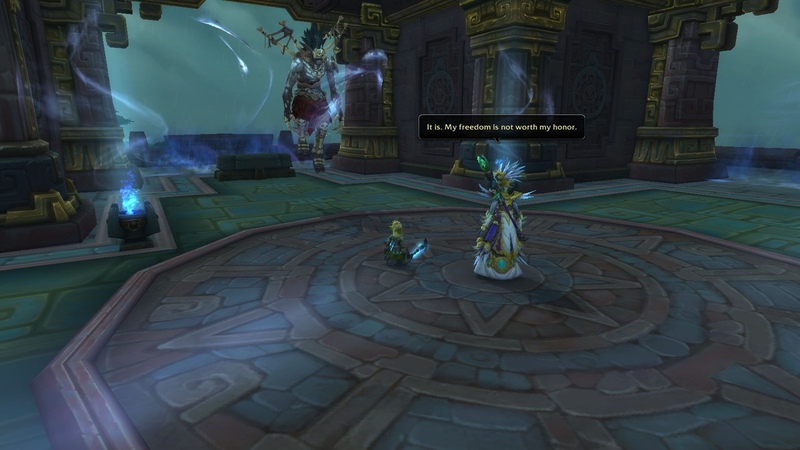 I liked the questline for being relatively short, located in one place, and wrapping up the Rastakhan/Talanji arc. It didn’t feel too climactic though, I didn’t feel my spirits rise even during her crowning speech. And Sylvanas/Blightcaller annoy me as hell – I hust want them on the other side of the barricades. 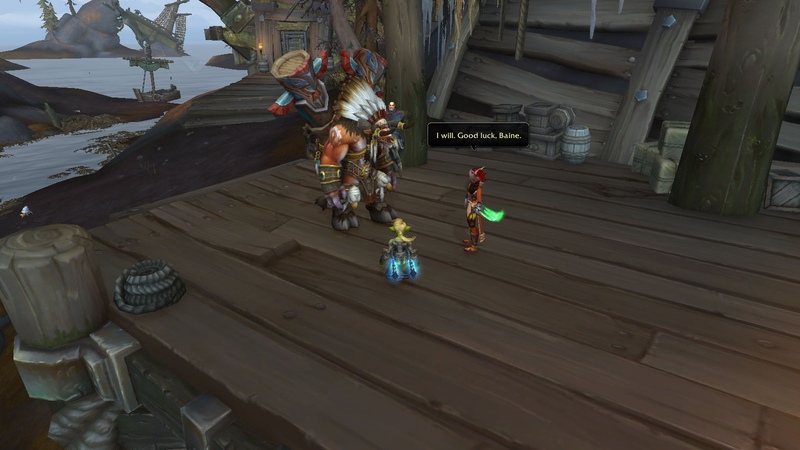 It is a high time we had our personal riot running, so at the beginning of the war campaign quest a Tauren messenger approaches you and slips a secret note from Baine. Yet again, we get a choice of how to act. Schlitzchen previously played along Sylvanas and dark rangers in Saurfang’s cause, so she picked an option of telling Blightcaller before going. He sends you to do whatever Baine’s asks in any case, and then tell him. 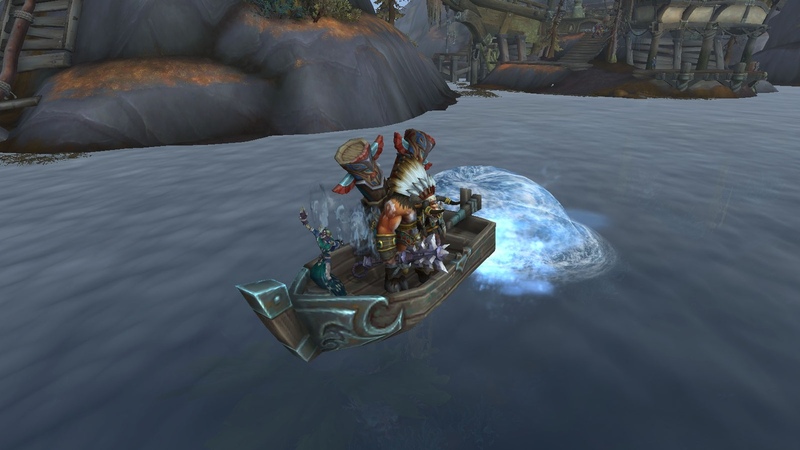 Baine, Zelling and champion then set off to board the Sylvanas’ flagship where Derek Proudmoore is held in a cage. It is a brutal clash with the crew – some undead run when you defeat them, but the others and the dark rangers are ready to die for Sylvanas. We clear the ship and get THREE keys to unlock the Derek’s cage. He’s an undead now, but not a mindless murderous pawn yet. 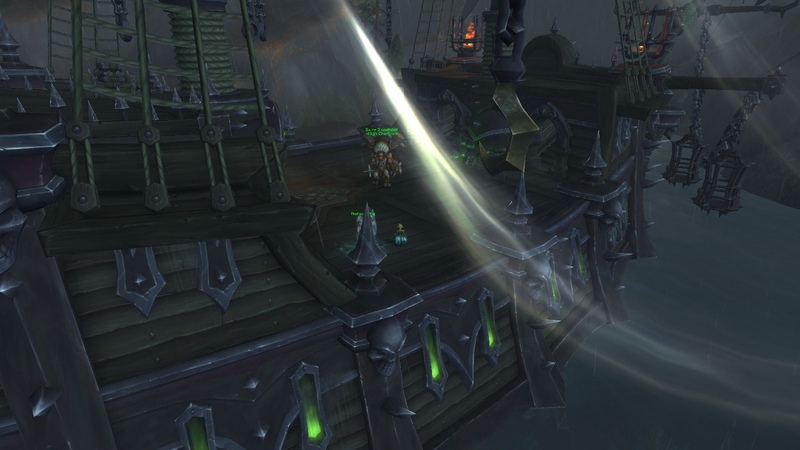 The ship is hijacked (it’s cool to have a tidesage along), and sets out to Theramore. What is left is an amazing cinematic. Jaina’s Kul Tiran and our stolen juggernaughts are connected side to side with a gangplank, and Baine has the most touching conversation with Jaina. The initial hostility is quickly doused. Jaina perfectly knows what Baine is, and Derek is admitting that he was planned to be a weapon against his family, but he didn’t manage to get his mind twisted due to Baine’s interference. The cinematic brought me to tears, I feel for all three of them deeply. Upon our return, we need to disguise our hijacking as a pirate deed, for what we need to complete a mission at the mission table. And we have a talk to Nathanos (well, I just play along the story) and tell him everything – so he says that Baine and Zelling can be considered dead when Sylvanas learns about it. May I remind you that Derek Proudmoore was her only current idea to crush the Alliance (lol). That was an excellent arc – with both my desire to finally do something, anything against Sylvanas and one of the most touching cinematics in the expansion so far. Next part: hunting the escaped Lady Ashvane on the Alliance side! I bet it would be exciting.